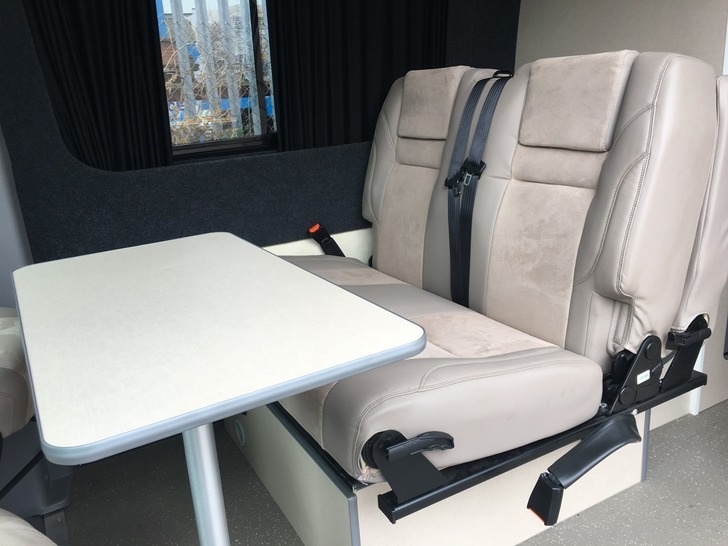 This is an exciting move into the larger Motorhome/Racevan type conversion for AMA Transporters Ltd.
We have been asked many times if we convert the larger vans, well now we do. We have an on-site demo van for you to come and see. It is a LWB high roof Volkswagen Crafter. With so many "Sportvan Racevan" type conversions about we though the conversion in this particular should be a 4 berth motorhome style. 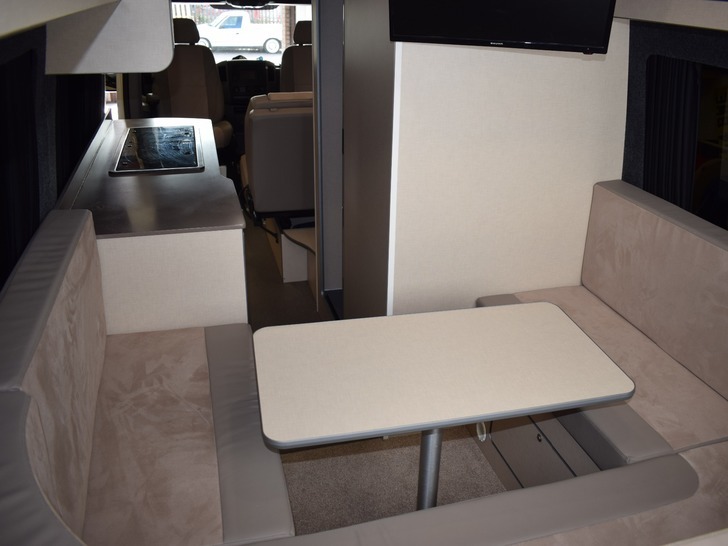 It has 4 proper travelling seats, 2 double beds, 1 being the popular RIB Altair while the other is a rear lounge area which easily converts into a double bed. There also a kitchen area with hob, sink, oven and fridge. 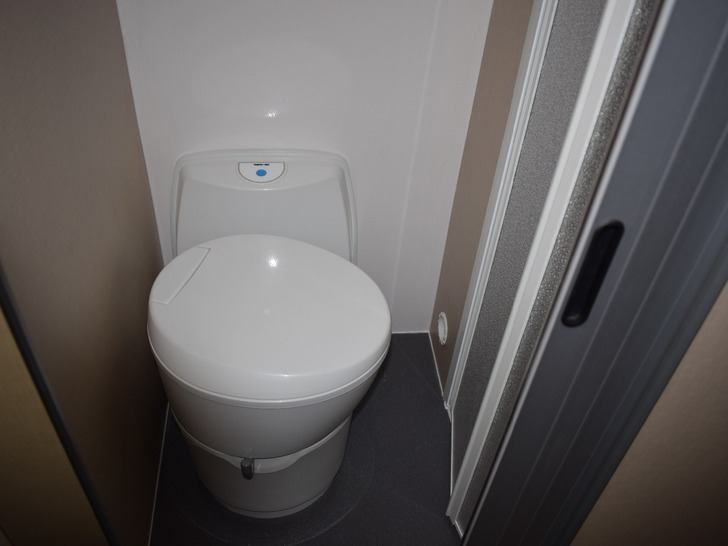 The shower room has a separate toilet, so no straggling the loo for a stand up shower. 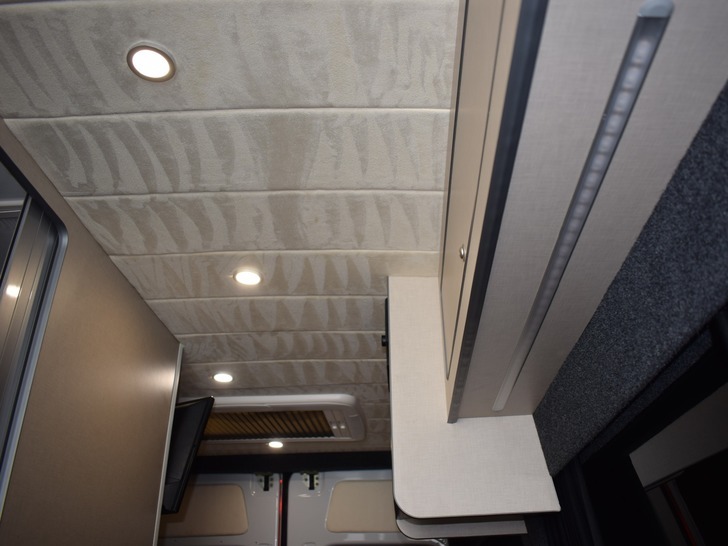 The Craftour is also graced with solar panel, water boiler, hot air heating, Dometic wind out awning, Wifi and external barbecue point and hot & cold shower point. With windows all round and a large roof light the whole feel is bright and airy, yet stays warm when needed. Black out curtains ensure a good night sleep while the floor level motion sensing lights make sure you can find your way around if needed. Roof lighting is operated by touch sensing switches with three separate zones, as are the under cupboard lights. The shower has its own wall mounted lights as well as a ceiling light in the toilet area. Bluetooth connectivity gives background audio from the hidden speakers in three zones including the shower room. There are 2 tables with seating for 4 around each, so effectively giving 2 dining areas for those cold or wet days, although far better is the shade or shelter of the wind awning whilst cooking on the barbecue. This is connected, via an external point, to the vans under-slung 25L LPG tank. The barbecue is just one of the items which can be washed using the external hot shower which uses water from the 70L under-slung fresh water tank and is heated by the Truma combi boiler. 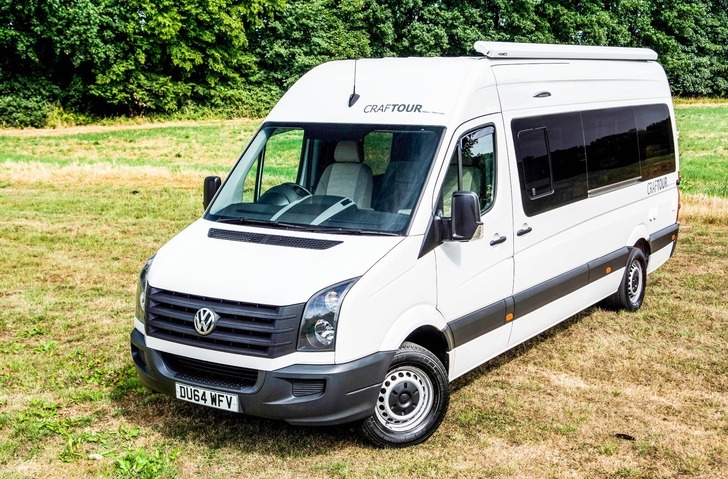 This really is a van to go off travelling and touring in, off grid the solar panel and split charge system give more than enough power to run all the 12v electrics. If you prefer the use of mains electricity available the leisure battery will also be charged while the van is on hook up. 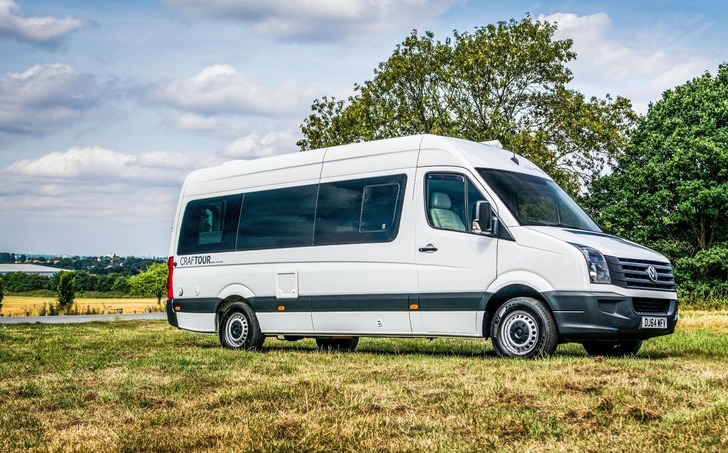 This is just an example of what can be done with the Crafter/Sprinter range of vans. We are more than happy to discuss any conversion on these larger vans from the many different manufacturers. Give us a call to talk about your requirements.